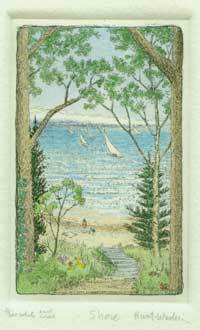 When i was growing up, my family spent one week every summer at a cottage overlooking the beach in Lakeside Michigan. Dennis bought a cottage for us in South Haven. Michigan, after which our daughter, Haven, was named. This etching captures the feeling, in small format, of those places and times. A woman and boy enjoy the beach at water's edge, viewed from the bluff above. Tiny names and scriptures are scribed into the copper, and the handcolored water is unique to every impression.